The uncatalogued items in the North Wales Hospital collection were packed away upon the closure of the Hospital in Denbigh and have not received treatment until appropriate funding was available. Now at the beginning of this Welcome funded project I am here as a Project Conservator to undertake a conservation survey of the collection. My survey includes looking at the current condition of each item and recommending conservation treatment and improved storage to stop further deterioration of the collection once it is open to the public. Historic items degrade over time, as a conservator we cannot stop the deterioration but we can slow down the process, keeping the item in a usable state for a longer period. One of the key ways of preserving a collection is to make sure it is boxed suitably. Some of the most difficult items to store in collections are maps and plans due to their size. 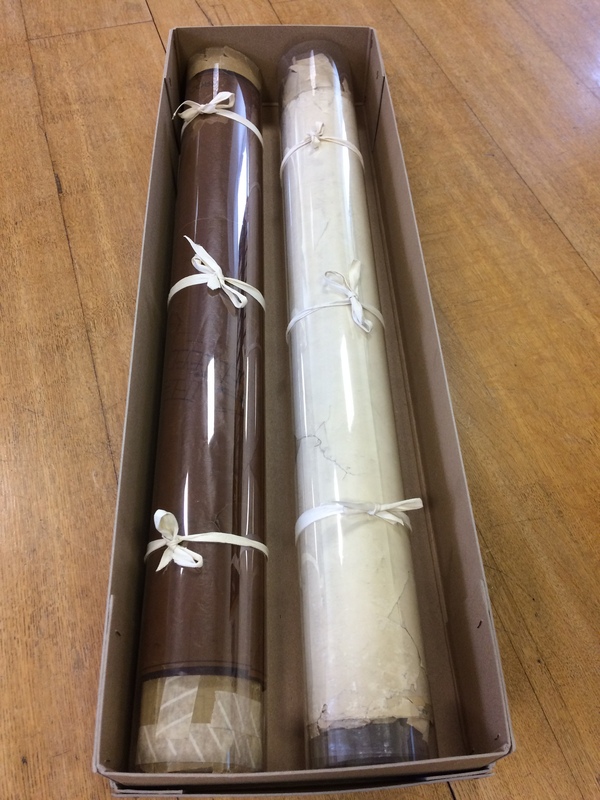 Denbighshire Archives have long map boxes as primary packaging which protects the large documents from environmental damages caused by dust, light and changes in temperature. Currently inside each box the maps and plans are loosely rolled but due to the amount of documents, some have been squashed or creased. The edges of documents are the most at risk and many of the maps and plans in this collection are very fragile due to tears around the edges. To provide stable storage for these documents until further conservation work can be undertaken, I have designed a rehousing method that will protect the edges of the large documents and stop them from deteriorating further. 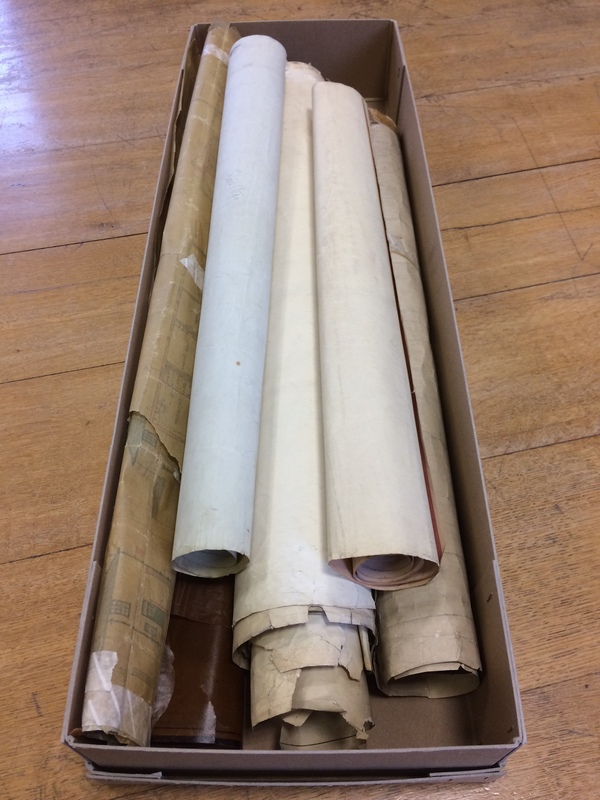 The rehousing method involves each bundle of maps and plans to be rolled around a conservation grade tube. This supports the rolled documents from becoming squashed and creased. Each rolled bundle will be wrapped in a Melinex® sheet tied loosely with cotton tape to secure. The Melinex® sheet extends the length of the documents therefore protecting the fragile edges. The maps and plans in this collection contain many drawings for extensions and changes to the building over the years including some colourful detailed plans of the laundry plant in the hospital. This entry was posted on November 25, 2017 at 9:00 am and is filed under Uncategorized. You can follow any responses to this entry through the RSS 2.0 feed. You can leave a response, or trackback from your own site.